One of the important services we provide is an inspection of the chimney system before a home is purchased to detect any problems that could be missed during a general home inspection. This is not just a service for those planning the purchase of a home ~ many of our satisfied clients are homeowners in the process of selling their homes who wish to be aware of any potential problems which might delay the sale of their home. We’ve included some graphics so you will have a better understanding of what the chimney professional will be doing should he perform a chimney inspection at your home. The equipment used is essentially two parts: a camera & monitor. 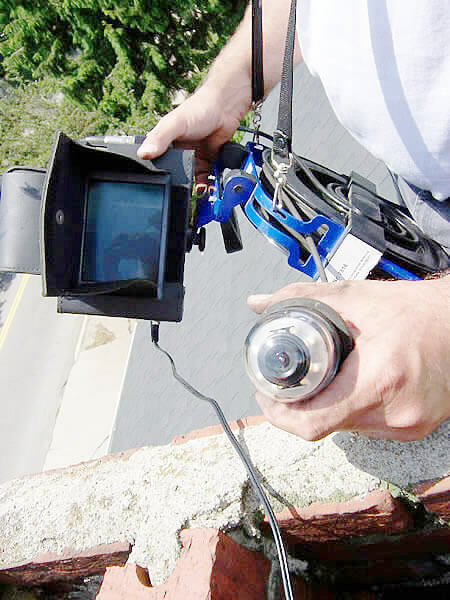 In the first photo below, the chimney professional is holding the camera in his left hand. In his right, is the monitor which is more easily visible in the third and fourth photos. 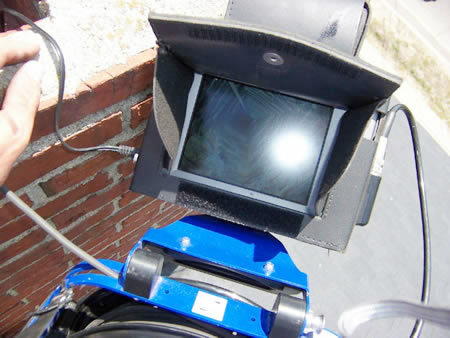 As the camera is lowered into the chimney, what it sees is shown on the monitor. 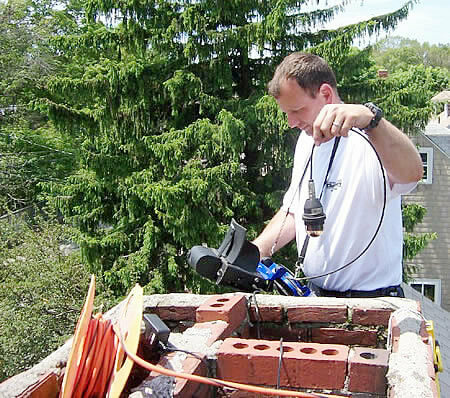 The chimney sweep can thus evaluate the interior of the chimney and report to the homeowner what has been seen. Normally, the video scan of the chimney is done from inside the home and thus the homeowner is easily able to view the results of the scan. Upon request, we can also make a video recording of the interior which will show the condition of the chimney.